La Vallee de Dalat is majestically situated a mile above sea level with each villa cleverly nestled into a pine-covered hillside overlooking a lush valley and rolling mountains. Unlike most real estate in Vietnam, the gradual slope of the property has enabled the architect to design homes that feature spacious terraces or decks on each level. 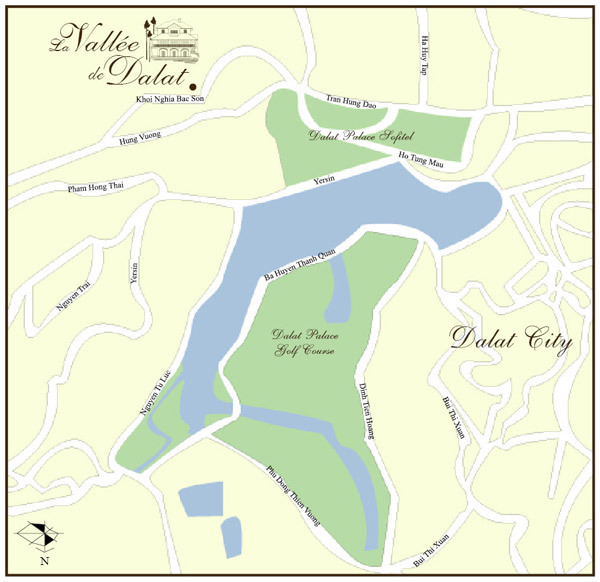 Such areas not only allow residents to feel closer to nature; they enhance the unique, colonial-era style of La Vallee de Dalat. What’s more, thoughtful consideration has been given to landscaping and infrastructure, resulting in a well-planned community that is both beautiful to look at and easy to access and navigate. If you’ve ever dreamed of owning one of the most exclusive houses in Vietnam, with views you won’t find anywhere else in Asia, look no further than La Vallee de Dalat. Only walled and guarded residential development in Dalat. Superbly designed French villa architecture with modern, Western-style interiors. 4 bedrooms (including a large master bedroom suite with fireplace and his and her bathrooms), maid’s room and 7-8 bathrooms. Large living room and separate family rooms with fireplaces and a separate space on the basement level for a music or karaoke room. Custom fitted kitchen and bathrooms with granite and marble counter tops. Large decks, including ground-floor deck suitable for entertaining. Large garden and open common areas for children or entertaining. Just off of Khoi Nghia Bac Son Street, on a secluded plot of premier Vietnam real estate, adjacent to historic Bao Dai Palace II and minutes from storied Dalat Palace Golf Club.